Here’s a leftover pic from my recent trip to Trinidad. Photographer Andrew Currie had left it out of his initial set because my face appears a bit blurry. I’m actually thankful for this, since the blurriness subtracts five years from my appearance! 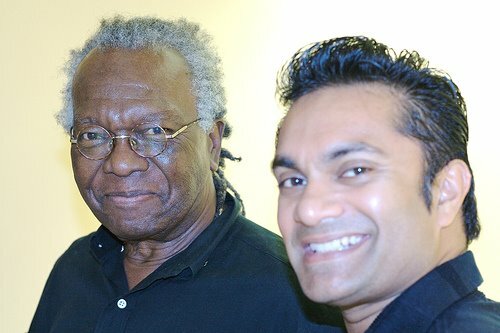 The gentleman with me is, of course, the great Austin Clarke. It was one of the highlights of my young writing career, sharing the stage with Austin. There is more debate to be had regarding the Lancet study which estimates 650,000 dead as a result of the war in Iraq. I’m particularly riled up over a comment made by a visitor on Rondi’s blog, essentially that the Lancet is “siding with the Jihadis”. This is the sort of the hypocriticial discourse-suppressing crap that makes my blood boil. Apparently, unless a science journal publishes data that supports the pro-war agenda, it’s “siding with the Jihadis”. Here is a very readable article that well summarizes the dimensions of the study. It points out that the take-home message isn’t the exact number of estimated excess deaths, but the magnitude of the estimate; it far exceeds Bush’s “off the cuff” estimate of 30,000. Someone –I think it was D-Mack or Mischa– had asked if the study’s methodology was a commonly used one. In response, here are some quotes from people who should know. I got them from this source. Let us not forget that the authors of the study aren’t a bunch of freshly graduated Masters students or freshman professors looking to build a career. Rather, they include world class public health researchers from the Bloomberg School of Public Heath at John Hopkins University. During my two years consulting to the NIH in Washington, DC, I was daily humbled by the brilliant epidemiologists that issued from that school. This doesn’t mean the study is not flawed. I reserve final judgement for when the full methodology becomes available. I just wanted to point out three things: that some very credible leading minds in the area approve of the methodology; that the authors are themselves leading public health researchers; and that the study was peer-reviewed before being allowed onto the pages of the Lancet. The researchers’ inability to interview families that have fled from Iraq could bias the results in either direction. If they fled because some had already died, then this would underestimate deaths. If they fled before any one of them could be killed, then this would overestimate deaths. Any fair and rational discussion of the study’s relevance and rigor must touch upon all of these biases, not just the ones that skew the results in a direction unfavourable to a preconceived agenda. “This point should be emphasized. Let’s say that the study is way off, off by a factor of 10 or five—in other words, that the right number isn’t 655,000 but something between 65,500 and 131,000. That is still a ghastly number—a number that, apart from all other considerations, renders this war a monumental mistake. Here’s the key question: Had it been known ahead of time that invading Iraq would result in the deaths of 100,000 Iraqis (or 50,000, or pick your own threshold number), would the president have made—would Congress have voted to authorize, would any editorial writer or public figure have endorsed—a decision to go to war? Does that make you as nauseous as it does me? I’m reminded of the so-called “controversy” surrounding Climate Change. There is no controversy. Pretty close to 100% of the global scientific community agrees that Climate Change is real. But the media, in an effort to be “fair and balanced” gives equal time to industry mouthpieces who deny the science, giving rise to the illusion of disagreement among scientists.